The classic barbell lifts always get the most love, and for good reason. They're effective, and they don't require much specialized equipment, so pretty much anybody, anywhere can do them. I hope you know by now—even if you're not always putting that knowledge into action—that these are the bread-and-butter lifts that should form the backbone of your program. But this doesn't mean you shouldn't save some space for more specialized work. I'm not talking about cables or any of the cam-based machines that mimic barbell and dumbbell lifts. 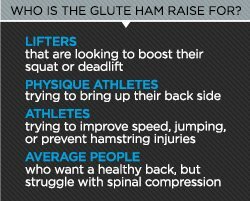 I'm talking about a relative newcomer that has been earning accolades from strength coaches everywhere in recent years: the glute-ham raise. The first time you see a video of this movement, it looks, in a word, difficult. You might even rub your hamstrings purely out of fear. This is warranted, because the glute-ham raise is a lower-body scorcher of the first order. But perhaps because of this, it's also an exercise that can have a "what the hell" effect after you work it into your program. Lifters may find their squat or deadlift getting an unexpected boost, and sprinters and other athletes might suddenly discover they have access to a whole other gear. Is it easy? Definitely not! It's not even easy to find the equipment to do it. But that's no excuse to ignore it, as you'll soon see. Many weightlifting programs tend to focus too much on the muscles of the anterior (front) of the body and not enough on the muscles of the posterior (back). The posterior chain, as it's become known, comprises all the muscles that you can't see in the mirror. This includes the upper back, including the rotator cuff muscles, rhomboids and lats, spinal erectors, and particularly the glutes and hamstrings. Neglecting these muscles in favor of the chest, arms, and quads can leave you a lot less strong than you look—which is never a good thing. You might have a six-pack but suffer from back pain; epic arms and shoulders but terrible posture; or monster thighs backed with weak hamstrings that are prone to pulls. Stop me when I get to your problem. The solution to this problem is to place more emphasis on the muscles of the posterior chain, and the glute-ham raise is one of the best movements to help. In the complete version of the movement (which many people have to build up to), you perform a back extension followed by flexing your knees, all while maintaining extended hips. This puts incredible demands on your hamstrings, but also works your glutes, calves, and spinal erectors. All that stuff about posterior chain might sound great, but it's understandable if you're still a bit suspicious—especially because the glute-ham raise requires you to track down specific equipment. After all, if you're doing squats and deadlift variations already, aren't you getting enough posterior chain work in? And then there are those back extensions and leg curls—together, they're basically the same thing, right? Wrong. 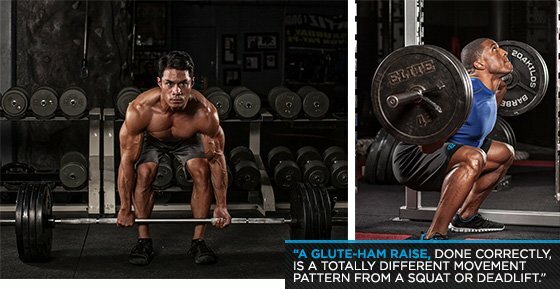 A glute-ham raise, done correctly, is a totally different movement pattern from all of those mentioned above. As you struggle to maintain a straight body from the neck down through your knees, you train hip extension and knee flexion simultaneously—something that doesn't happen during any other movement. The glutes extend the hips, and the hamstrings both extend the hip and flex (or bend) the knee. Traditional movements like squats and leg curls only train one of those functions at a time; since the glute-ham raise works both, it offers unique benefits when it comes to explosive power and hamstring strength. 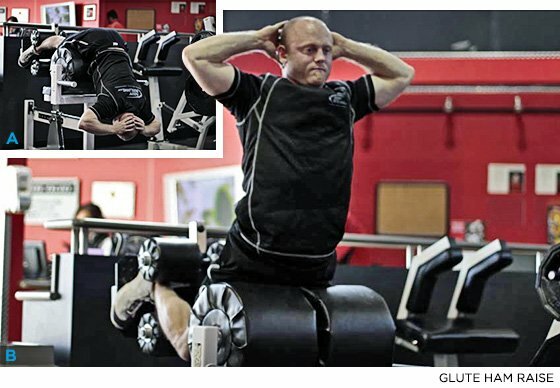 You'll also need to be able to generate significant muscular tension and control in order to do this movement for reps. This makes it a far more athletic movement than either back extensions or leg curls. And because the glute-ham raise is performed without weight, it's a great option for people who want the posterior benefits of heavy squatting or deadlifts, but who are limited by the heavy spinal loading those moves require. The most common reason lifters don't include the glute-ham raise in their programs is that they don't have access to the equipment needed to do it. This is a legitimate hurdle that you should discuss with your gym's owner immediately. However, it also has a simple solution—if you're up to the challenge. I'm referring to the so-called "natural" glute-ham raise. The beauty of this version is that it can be done pretty much anywhere, such as the bench on a lat pull-down machine or some variety of decline ab bench. You could even just have a training partner hold your ankles while you're on the floor. Using the ab bench as an example, you simply lie face-down, hook your ankles under the pad for support, and perform a glute-ham raise, either from the bottom up or the top down. Just because it's natural doesn't make it easy. The natural glute-ham raise is much more difficult than the machine version. Even advanced trainees normally find they won't be able to perform it unassisted at first, so set your expectations accordingly. The simplest way to approach the movement is by performing a slow negative first, and then using your arms to give a little assistance on the way up. This isn't necessarily pretty, and it won't allow you to train as great a range of movement as the bench variety, but it's definitely effective. The glute-ham raise isn't a "classic" exercise, and you might think you can live the rest of your life without it. This could be true. For most gym-goers, it will make the most sense as way to help them do something else better—such as the big lifts, or speed-heavy athletics. If that sounds like you, consider carving out space for it in your program. The best way to start taking advantage of the glute-ham raise is as an assistance movement on your lower body training day. Start off with just your body weight and see how many good reps you can do. Once you can easily do multiple sets of 10, consider adding a little weight by holding a plate or dumbbell. If you don't have a bench and need to use the natural variation, take a little more care. Start out by doing low-rep sets of negative assisted reps. Put these in as an assistance movement on your lower body days after you squat or deadlift, working your way up to 3-4 sets of 10. Don't rush it, though. The negatives are incredibly demanding and will leave you sore.